These chocolate pancakes are flipping delicious (pun intended). If passionfruit are out of season, try topping with raspberry coulis or even warmed strawberry jam works a treat. 1 Whisk together buttermilk, melted butter, egg and vanilla in a bowl. Sift flour, baking powder, sugar and cocoa into another bowl. Whisk the wet ingredients into the dry ingredients to form a thick batter. Fold in chocolate chips. 2 Heat a little oil in a large non-stick frying pan. Working in batches, add spoonfuls of batter to form small pancakes (hotcakes). Cook for 2-3 minutes over a medium heat until bubbles start to show on the surface. Turn over and cook for 1-2 minutes more. 3 Repeat process with remaining batter, adding more oil to the pan when necessary, until you have made 12 hotcakes. 4 Transfer hotcakes to paper towels and cover with foil to keep them warm until all hotcakes are made. 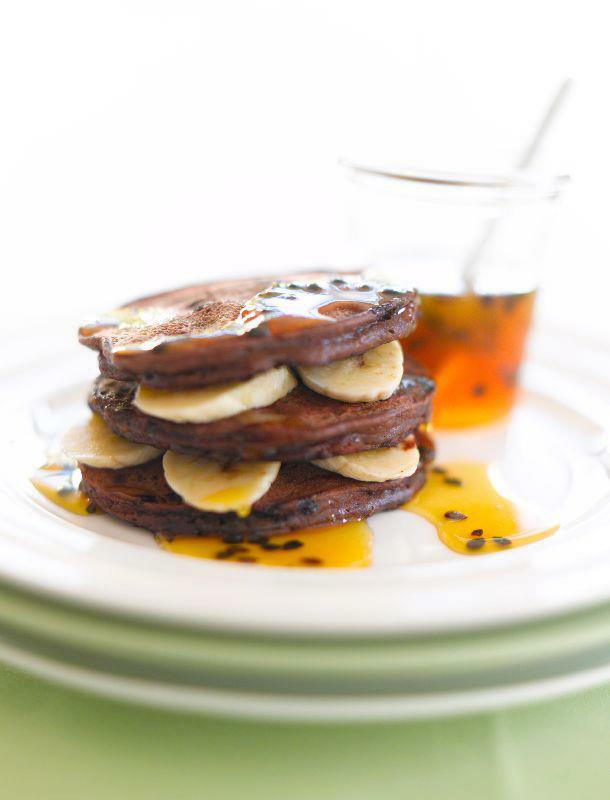 Serve 3 hotcakes per person, layered with sliced banana. Drizzle with passionfruit syrup and serve immediately.